You’ve probably grown familiar with the signs that your body gives you right before your period. Suddenly, you have unexplained back pain, an upset stomach, crazy mood swings, and a ravenous appetite. All of these things, or just one or two of them, usually indicate that your period is approaching. When these signs start to surface, consider grabbing a green tea. Green tea might be able to ease some of the undesirable symptoms that are inevitably coming. Staying hydrated is a vital part of maintaining your health but it becomes especially important during your period. In fact, staying hydrated can combat bloating and can also help your digestive system run smoothly, which often causes issues during your time of the month. Plus, drinking water constantly can get dull. When you get tired of drinking bottle after bottle, consider switching over to green tea. Green tea is a beverage that comes with plenty of benefits. In fact, you should consider incorporating green tea into your daily water intake routine. All of the antioxidants can help sooth your cramps during your period and it actually has a taste, which can make it easier to drink. 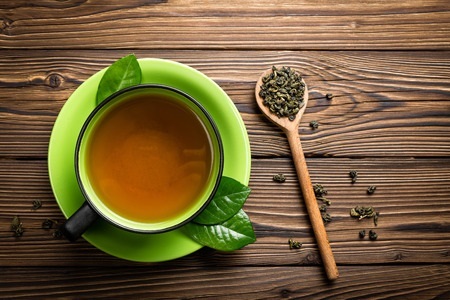 For avid coffee drinkers who might find their coffee addiction wreaking havoc on their tummy during their time of the month, swap out a coffee for a green tea. Green tea is the least processed tea and has a relatively decent amount of caffeine. So on those days when you’re feeling fatigued but can’t stomach coffee, a green tea will give you the energy you need without being too harsh on your stomach. Comforté knows that the week of your period can be exceptionally unpleasant and uncomfortable but green tea and natural menstrual cramp relief can help you through it.